Wall of Icky. Photo by Mike Higdon. In Nevada, brewpubs like Great Basin Brewing Co. can only produce 15,000 barrels (465,000 gallons) of beer per year. What happens when they hit that level? They have to stop making it and thirsty beer lovers can no longer buy it. But this legislative session, that could change. Today, brewpub owners from all over Nevada presented their case for increasing the production cap to unlimited. You can use a simple online form to tell the Nevada legislators what you think about this law change. Just click the link and find or type in “SB139” and select For or Against (comment optional). How does this effect you? Context: Brewpubs are breweries with tasting rooms and can only produce 15,000 barrels. Great Basin and BJ’s Brewhouse are approaching their annual limits, preventing them from growing without converting into a brewery and closing down tasting rooms, which Great Basin already did for the Taps & Tanks location. There are 35 brewing companies in Nevada, almost all of which are classified as brewpubs. Why should you care: Liquor laws effect a business owner’s decision to open a brewpub in Nevada. More flexible liquor laws encourage more brewpubs, which give more consumer choices and influences the price of a keg, pint, can or bottle. Check out this letter from Tom Young at Great Basin. For: Unlimited beer production is better for the economy by generating more tax revenue and jobs, small businesses, tourism and overall happiness. Context: In Nevada and many other states, there is a legal distinction between a brewpub and a brewery. Distributors (wholesalers) are legally required to ship liquor from the liquor producers (supplier) to retailers. This is called the three-tier system. The brewpub law allows a brewpub to sell its beer on premise in a tasting room without using a distributor to distribute to itself. A brewery may not sell beer on premise. Breweries have no production limit in Nevada. Historical background: Distributors were created after prohibition to prevent monopolies, specifically out of fear that Budweiser and the like would own breweries and bars or liquor stores and push out all other beer competition by controlling the tap handles of every retail outlet. The three-tier system was created to prevent that and impose other liquor controls that weren’t in effect when America was driven into a state of constant drunkenness. In 1992 when Nevada’s brewpub law passed, production limitations were included for Clark County (15,000 barrels) and all other counties (5,000 barrels) to prevent large-scale breweries from dominating and overpowering small local businesses. At the last legislative session, the number was changed to 15,000 for the whole state. Now that Great Basin Brewing Co. and BJ’s Brewhouse are approaching those limits, it’s time to raise them again. Regional context: California’s brewpub law only allows 5,000 barrels, which is why BJ’s at the Summit Mall produces beer for all of BJ’s Brewhouse locations in the West (one brewery in Nevada vs. three in California). But Colorado and Utah allow brewpubs to produce 60,000 barrels. Oregon, in its infinite wisdom, allows small breweries to self-distribute up to 5,000 barrels and for brewpubs to produce 200,000 barrels. Similarly, California, Colorado and Washington allows limited self-distribution. In each state, production breweries can produce unlimited beer. Source. Argument for: Brewpub owners’ arguments hinged on the future economic growth of the craft beer industry in Nevada. They want to continue to grow Nevada into a beer destination that competes with surrounding states. They argue that with unlimited production and growth, the brewpubs would pay more liquor excise taxes to the state when they sell and export beer in addition to growing their businesses and being allowed to create and meet higher demand for craft beer. Argument against: Lobbyist Alfredo Alonzo, who represents many of Nevada’s distributors opposed the bill change. His straw man argument cited prohibition’s limitations on liquor — an 80-year-old repealed constitutional amendment that actually hurts the distributors he represents if taken seriously. He continued to point out that very few brewpubs in the United States don’t produce more than 7,000 barrels, begging the question, why raise the limit if no one comes close to it, except one person (for which he meant Great Basin or BJ’s). Why that argument makes no sense: If wholesalers must legally distribute liquor, but a law limits the amount of liquor a brewpub can produce, then how can a distributor make more money if it can’t distribute more beer? If there’s a limit, profits to the state, brewpub, distributors and investors hits a ceiling #AntiCapitalist. The on-premise sale of beer can only account for so much. If a brewery plans to expand, it’s going to need a distributor to take the beer to retailers. 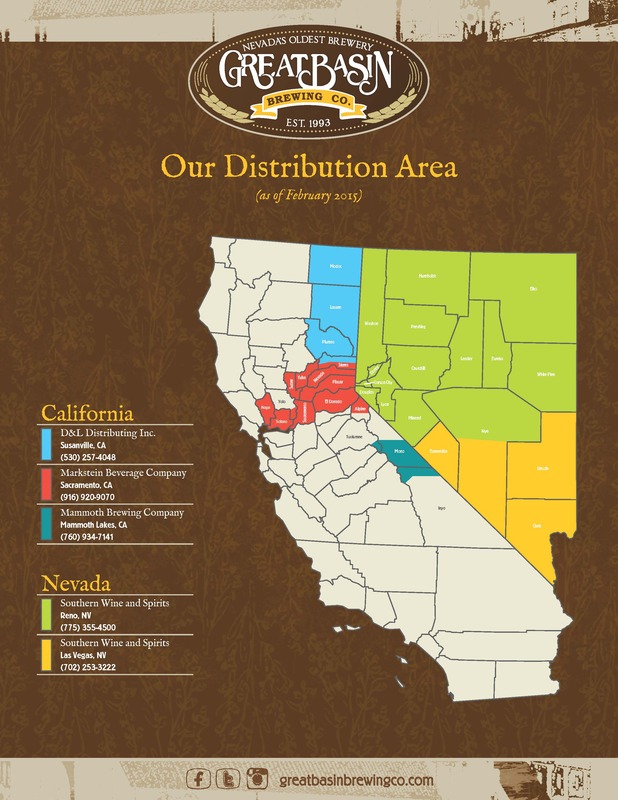 Great Basin Brewing Co. is the largest beer producer in Nevada. Click to enlarge. Graphic by Great Basin Brewing Co.
Oregon, Colorado, Washington and California can all self-distribute limited amounts of beer. This entry was posted in Beer and tagged beer, liquor law, nevada. Bookmark the permalink.